As another year marches on, we would like to take this opportunity to thank all of the loyal patients who make our practice possible. Thank you for your warm smiles, thoughtful gifts, and shared stories. We appreciate everyone who passes through our doors. We feel that every day is a blessing and having you as part of our lives enriches our life experience in so many ways. Thank you! We are excited to now offer non-invasive laser treatment for basal cell cancer (BCC), the most common skin cancer. More than 4 million cases of BCC are diagnosed in the US each year. Recent expert studies support using Nd:YAG laser for many cases of basal cell cancer, particularly those located off the face. This laser penetrates deeply into the skin and targets the blood supply feeding the cancer. Laser therapy has the potential to eradicate BCC in one treatment session without leaving an open wound or requiring the use of messy creams. We predict that this emerging therapy will revolutionize the way that dermatologists treat basal cell cancer. Will laser replace surgery completely? No, not for more invasive cancers, but laser treatment is a big step forward in the battle against skin cancer. Effective November 1, 2018, our direct pay fees will undergo a small price increase. Please refer to the Fee Schedule for our exact fees. 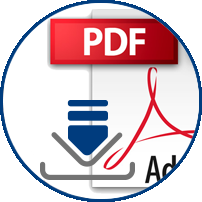 This adjustment is necessary to keep up with the increasing costs of running a medical practice. 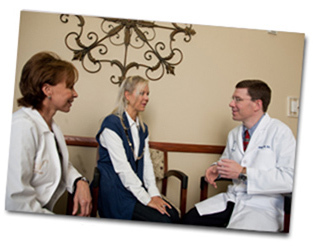 Our commitment to provide outstanding dermatology care coupled with reasonable and transparent fees remains unchanged. Thank you. October 2, 2018 8:18 pm - PRP is here! This summer we added something new and exciting to our practice- platelet rich plasma or PRP! Rich in growth factors, PRP is widely used to repair tissue and enhance healing. We prepare PRP by spinning a small sample of your own blood. We are using PRP together with SkinPen® microneedling to stimulate cell renewal and collagen formation. We are also injecting PRP into the scalp to reverse hair loss and promote hair growth. Patient feedback has been amazing! We are so excited to offer PRP to our patients! A recent article, "Skin Cancers Rise, along with Questionable Treatments" in the New York Times exposed the dark side of dermatology. As more and more practices sell out to national chains, patient care is suffering. Patients are being seen by poorly-supervised physician assistants masquerading as dermatologists. Visits are cold and rushed, too many skin biopsies are done to maximize revenue, and skin cancers are missed. In our direct pay practice, we still focus on the old-fashioned things, such as eye contact, healing touch, and bedside manner. We believe that the best medical care occurs when you have a personal doctor who takes the time to listen to you, perform a thorough exam, and answer all of your questions. When the patient is routinely paying the bills, the doctor answers to no one but the patient. We look forward to serving you. There will be a small increase to our fees for medical dermatology, effective October 1, 2017. Please refer to our new Fee Schedule under Direct Pay. This adjustment reflects the ever-rising cost of running a medical practice. As always, we remain committed to providing high quality, affordable care to our patients. Thank you for your understanding. Jun 25, 2017 8:15 pm - New Fractional Laser! We are excited to announce that we have added a new, non-ablative fractional laser to our Lone Tree practice. Emerge℠ provides a gentle yet effective way to resurface the skin with minimal downtime. This laser is similar to other fractional lasers, including Clear+Brilliant® and Halo℠. Studies have shown that a series of treatments with Emerge℠ leads to improvement in fine lines, wrinkles, brown spots, and acne scars. Discomfort is minimal and downtime is limited to mild redness for a day or two. Best of all, treatment with Emerge℠ is affordable for our patients! We encourage you to make an appointment to learn more about this exciting new laser technology. 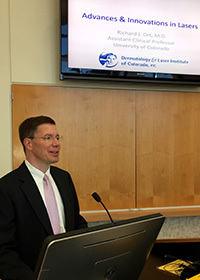 On May 5, Dr. Ort gave a formal presentation about lasers to the Colorado Dermatologic Society. It was a true honor for Dr. Ort to be invited to speak at this regional event. Dr. Ort gave a detailed overview of lasers in dermatology with special emphasis on innovations and advances in lasers. Topics covered included: lasers in the treatment of vascular lesions (including port wine stains), pigmented lesions (including café au lait macules), tattoo removal, picosecond lasers, IPL, and fractional lasers (including Fraxel). The hour-long talk was attended by over fifty local dermatologists and was very well-received. Dr. Ort would like to thank the members of the Colorado Dermatologic Society for their hospitality and support. We recently celebrated the one-year anniversary of our direct pay practice! We remain committed to providing affordable, high-quality dermatology care. We would like to show you how direct pay means no waiting, no co-pays, no surprise bills, and no hassle! November 16, 2016 6:00 pm - Does your dermatologist use a dermatoscope? Like a stethoscope to a cardiologist, a dermatoscope is an essential, non-invasive diagnostic tool for a dermatologist. A dermatoscope consists of a hand-held, bright, polarized magnifying lens. With this tool, a dermatologist can visualize structures in the skin that are invisible to the naked eye. This allows for more accurate diagnosis of moles, growths, and skin cancer. It reduces the need to remove normal moles while at the same time helping to detect skin cancer at an early stage, potentially saving lives. While not all dermatologists use a dermatoscope, Dr. Ort is a strong believer in the power of dermoscopy to detect skin cancer. However, a doctor can’t just pick up a dermatoscope and expect to be proficient in its use. It’s not the tool itself that matters, but rather the expert who has the expertise and experience to use the tool. Dr. Ort has devoted countless hours of study to master this advanced technique. With his advanced dermoscopy skills, he can evaluate a questionable mole and provide guidance on how best to proceed. The standard in our practice is to use a dermatoscope during any mole exam, for each and every patient. Effective November 1, 2016, our direct pay fees will undergo a small price increase. This adjustment reflects our increased cost of doing business. We are committed to keeping our fees both reasonable and affordable. Our many satisfied patients tell us that, compared to traditional practices, we offer a convenient and low-cost solution for their skin care needs. We thank you for your understanding. When Jimmy Carter announced that he had Stage IV metastatic melanoma spread to his brain and liver, many people assumed the worst. In point of fact, Jimmy Carter is a living testament to the dramatic advances in melanoma care that have been made in the last 10 years. Carter’s treatment included a combination of radiation therapy and a breakthrough medication called Keytruda. He recently announced the wonderful news that all signs of his cancer had disappeared. The last few years have seen a revolution in melanoma treatment. Immunotherapy drugs such as Keytruda and Yervoy stimulate the patient's own immune system to kill cancer cells. Melanomas are now known to harbor specific genetic mutations and precision drugs have been developed to target these mutations. Combining these therapies has led to a dramatic increase in life expectancy. There are a number of other promising treatments under development. Advances in melanoma treatment have also opened new pathways in the treatment of other cancers. The revolution in melanoma care has been one of the most exciting developments in my career as a physician. While it is true that early detection of melanoma is still critical, we can now provide HOPE to those patients with more advanced melanoma. We owe a debt of gratitude to all the doctors, research centers, and others who have contributed to these breakthroughs. March 27, 2016 – 4:38 am - Sculptra® - Your Secret to Youthful-Looking Skin? We are excited to reintroduce Sculptra to our practice. Sculptra is a unique filler that has stood the test of time as a valuable filler for skin rejuvenation. It is injected under the skin to replenish the skin’s inner structure, creating a natural, more youthful appearance. Its advantage over other fillers is that it can be injected over a large area to stimulate collagen production and provide full-face skin renewal. Sculptra works subtly and gradually over time and can last for more than 2 years. We are pleased to offer a Sculptra promotion through September 30, 2016, which provides up to $525 in savings! Please see our Specials for more information. I would like to take a moment to reflect on the past year. Our practice's biggest challenge and accomplishment of 2015 was our transition to a Direct Pay model. We would like to thank all of our patients who provided support and encouragement during this significant change. The transition was much smoother and more positively received by patients and doctors than we could have anticipated. One of the best things that I hear from my patients is "I wish all doctors would do what you’re doing." Our patients understand that there's something wrong with medicine today. Direct pay is our version of healthcare reform. I look forward to continuing to serve our loyal patients in the fields of medical, surgical, and cosmetic dermatology. We will continue to offer the latest dermatology advances as well as the best time-honored treatments. Our commitment remains to you, the patient, and no one else. I welcome your feedback at any time and will always strive to be responsive to your concerns. Here’s to a bright and beautiful New Year! I'm excited to announce that my practice will be moving to an innovative yet traditional way of practicing medicine called Direct Pay. Effective October 1, 2015, I will no longer participate with Medicare or any health insurance plan. Instead, my practice will have a reasonable, simple, and transparent fee schedule, which is posted on my website. By making this change, I will remove the increasing burden and cost of dealing with the government and insurance companies. I will work for you and only you. My passion is to practice patient-centered, state-of-the-art dermatology. My goal is to provide outstanding value to you, my patient. By eliminating the middleman, I can provide more personalized and cost-efficient care. You will be treated as an individual, not a number. Less time and resources spent worrying about restrictive government and insurance rules will mean increased access and availability for you. In exchange, I ask that you make payment, in full, at the time of service. My reasonable fees will allow the majority of you to afford care at my office without using your insurance. If you have a high deductible or no insurance, you will likely find that my fees are significantly less than what you are currently paying out of pocket! There will be no hidden or surprise fees. This is not a concierge practice where you will be charged an up-front fee to be a member of my practice. If you have out-of-network benefits, we will be able to provide you with the necessary information so you can submit an insurance claim for possible reimbursement. Unfortunately, if you have Medicare, you cannot be reimbursed for any of my medical services. I appreciate that a direct pay practice may not be the right fit for all of you. If you elect to transfer your care to another office, I humbly thank you for giving me the opportunity to care for you. 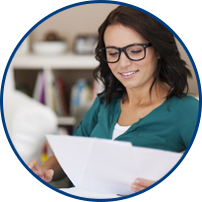 At your written request, my staff will provide a copy of your medical record. It is my sincere hope that after reviewing the information on this website, you will choose to continue your care with me. My staff and I would be happy to answer any questions that you might have. Please note that we will only accept Medicare and insurance up until 10.01.15. Thank you. As part of our recent relocation, we made a large donation to Project C.U.R.E. This charity is the largest provider of donated medical goods to developing countries around the world and has international headquarters in Centennial. We donated a truck-full of power and manual exam tables, stools, chairs, surgical lights, AED, IV poles, Mayo stands, and other medical supplies and equipment. More than 3.3 billion people live on less than $2.00 per day and cannot afford basic healthcare. Project C.U.R.E. delivers more than 100 semi-truck sized cargo containers of donated medical supplies annually, helping provide healthcare to the most vulnerable people in the world. We are grateful that we had the opportunity to support this worthy cause. There's a new wrinkle fighter in town- Xeomin! Studies have shown equivalent results between Botox and Xeomin in reducing wrinkles. Compared to Botox, Xeomin is more pure, containing only naked botulinum toxin, without unnecessary additives. This is beneficial because it may reduce the risk of developing an immune response to the product which can decrease its effectiveness. If you are thinking about trying Botox, now may be the perfect time to try Xeomin at introductory pricing! August 1, 2014 – 9:11 am - We've moved! We are excited to announce that we have moved to a sparkling, brand new office! 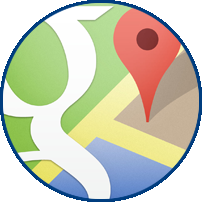 Even better, you won't have search for our new office – it's just down the hall from our old office! Our new space has exceeded our expectations and we have received many positive comments. While our physical space may have changed, our dedication to our patients has not. We look forward to serving you in our new office! 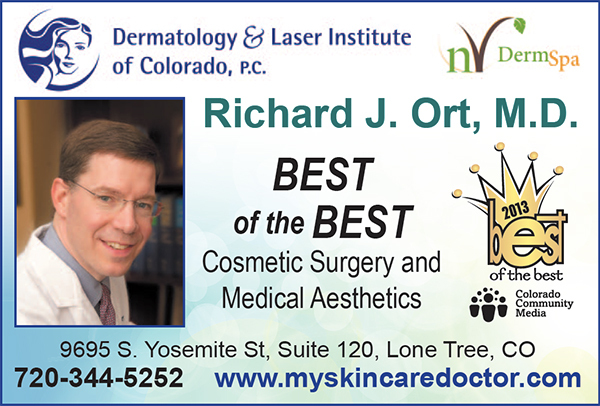 Dr. Richard Ort is proud to announce that he was recently voted BEST of the BEST in Cosmetic Surgery and Medical Aesthetics 2013 for Lone Tree and Highlands Ranch. Dr. Ort received this honor by getting the most votes from readers of the Lone Tree Voice and Highlands Ranch Herald newspapers. Dr. Ort would like to recognize and thank all of his patients for their votes and support. Dr. Ort is proud to be a local physician, business owner, and resident. Cosmetic services offered by Dr. Ort at nVDermSpa include Botox, fillers, lasers, microdermabrasion, laser hair removal, tattoo removal and chemical peels. If you are considering cosmetic surgery, Dr. Ort would feel privileged to be able to put his experience and skills to work for you! Thank you to all who took the time to vote for this year's Best of the Best! "Exilis® shrinks" fat cells and "contours" your body on the arms, back, stomach, knees, thighs and neck. Skin tightening can be done virtually everywhere, including the entire face. We are excited to celebrate the 10-year anniversary of the FDA approval of Botox® for the treatment of frown lines on the face. In the last decade, we have treated thousands of satisfied patients with Botox®. Our vast experience with Botox® has allowed us to refine our Botox® results. Most patients do not want the frozen look; but instead want the appearance of fewer wrinkles with a more rested look. Botox® is the most popular non-invasive treatment for facial rejuvenation in Denver and the United States. Why? Because it works well, it’s safe, and there’s no downtime. We look forward to providing the benefits of Botox® to many new clients, as well as our many loyal patients, over the next decade! March 12, 2012 – 9:00 am - Proud Sponsor of the 2012 Walk to Cure Psoriasis! March 12, 2012 – 9:00 am - New Tattoo Laser! We recently added the Q-switched ruby laser to our practice. We now offer four different lasers for tattoo removal: ruby, alexandrite, and two Nd:YAG lasers. No other practice in Denver is able to match this. Most competitors offer one laser which cannot treat all colors. With a choice of four tattoo lasers, we can pick the right laser for your tattoo every time. If you have a tattoo that no longer represents you, now is the time to get it removed!